“Where do you find your inspiration?” is among questions I am asked most frequently at lectures or when we teach. I try to explain to people that inspiration isn’t a book that I check out of the library every now and then. It’s the culmination of a lot of life experiences and influences from other creative thinkers in a variety of design disciplines. I think of inspiration as a big bucket in my head that every influence and life experience goes into. All of these ideas and influences mix together and then, every now and then, usually without my knowing it, a little bit sneaks out and gives me an idea for a totally new design. I have to continuously fill it back up with new and different experiences if I want to keep my creative juices flowing. 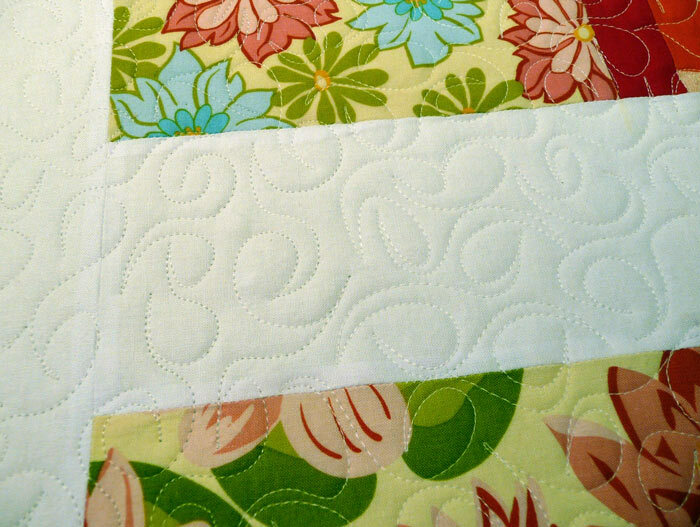 My favorite new machine-quilting pattern of the past couple of years has been the pattern that I refer to as “That Girl” and it is very much a product of this creative mash that resides in my brain. That Girl refers to the 1960’s sitcom featuring Marlo Thomas about a young woman named Anne Marie who is living in her first apartment in New York City trying to make it as an actress, who just happens to have a killer wardrobe. OK. Even if you have never seen this show before you have to love the photo above. That’s all you need to know. Cute-as-a-button Anne Marie walking a turkey (yes, a turkey, which I’m guessing she rescued in some whacky Thanksgiving episode? ) in Central Park wearing that totally mod black and yellow dress. I don’t remember the episode where she walked the turkey but I just LOVE that photo. As a preteen I adored this show because it showed a spunky young woman trying to live her dream. She was sweet and quirky but was always getting into sticky situations, which just made her more endearing. I also loved Anne Marie’s flip hairstyle, which was iconic of that era. There was a great graphic of the show that featured the flip as well and I loved that graphic! Unfortunately I could only find a low-res image of that graphic, but for those of you who are too young (you poor things!) to know about That Girl, here’s the graphic that inspired my quilting pattern. By the way, I remember a teen-age babysitter telling me that if I wanted that hairstyle that I would have to sleep with my hair rolled up around empty cans of frozen orange juice concentrate. I remember thinking that no hairstyle, even that cute flip, could be worth sleeping with a bunch of orange juice containers wrapped around your head! To this day I’m a “wash and wear” kinda girl. 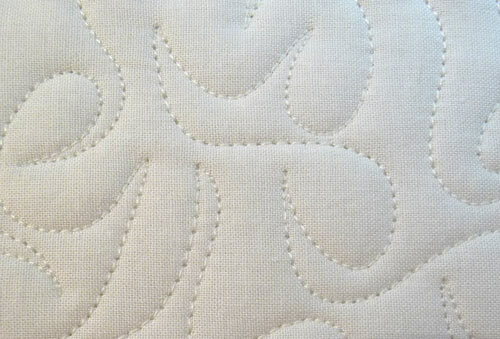 So one day I was experimenting with some new stitching patterns on our long-arm quilting machine and without thinking made a shape with the stitching that reminded me of the That Girl flip hairstyle. Although, sadly, I haven’t seen an episode of That Girl in over 30 years, I still remember that hairstyle and had an instant recognition of the shape as soon as I stitched it. I have spent the past few days stitching the quilt shown above, which will appear on a cover of Quilts & More Magazine in 2010. Bill and I immediately decided that the big, girly florals would look great with The That Girl stitching pattern because they are light, fun and feminine, just like the stitching. So there were two equally important parts of coming up with that pattern: recognizing a shape that I loved and putting my brain a relaxed frame of mind by doodling with the long-arm machine to allow the brain to do its work. To my mind inspiration comes from that combination: interesting influences and the frame of mind to process those influences into something else. By the way, I could have also called this stitching pattern the “Mary Tyler Moore” quilting pattern, because she too could totally rock a flip. you might check out hulu for old episodes! A song that moves me to tears. Finding out that something i said or did really meant something to someone. It’s often hard to allow myself to be creative, especially since we moved (LOL, 2 years ago) — all my organization and systems were uprooted too. Seems like creativity sneaks out when I’m caught up with something fun. BTW, I watched that show all the time. You’re right; she had a GREAT wardrobe. Never much cared for her uptight boyfriend Donald though. 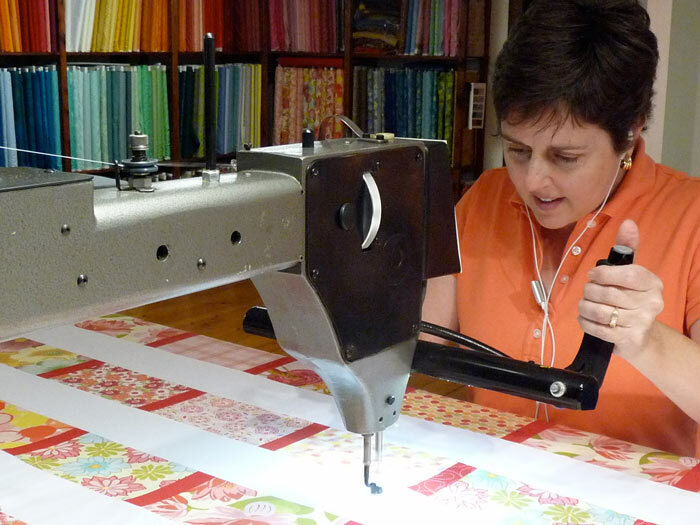 One more thing, when I moved I also left behind access to a long-arm quilting machine. I really, really, really want one. Is it really viable to buy and one and quilt for others in order to pay for it? I’m a perfectionist meanderer. You’ve already got my email address — I’m the winner from your interview on “Reclaiming the Home”. Thanks so much for my goodies and your kind note and email!!!!!!!!!!!! If I ever get to the Chicago area, your shop will be my first stop! I get a lot of inspiration from the architecture around me. The tile floors, interesting iron work, patterns in wood on houses, stained glass windows. There is so much out there, I sketch it all down and let it roll around in my head for awhile.